Why You Shouldn't Visit Japan During The "Golden Week". Why You Shouldn’t Visit Japan During The “Golden Week”. As much as I have fallen in love with Japan, I must advise against visiting during a very specific time of the year; the Golden Week. The trains get replaced with new shiny ones, food festivals are being held, live music is found everywhere, and fun events will be held at many hostels. But, there is a very big downside to this. First off, you may be wondering what Golden Week even is, to begin with. The short answer is that; it’s a week where most people in Japan along with a few other Asian countries (including Korea) usually have the entire week off. This happens because of a string of holidays that apparently were grouped together on intention. The first day is April 29th which is Showa Day. This day is dedicated to celebrating the birthday of the former Emperor Showa. Though, according to research, this used to be Greenery Day. Following that is Constitution Day on May 3rd; then Greenery Day (yes, the one that was originally April 29th) on May 4th. Greenery Day celebrates nature and plus it falls between 2 holidays which ended up basically making it a holiday as well; because Children’s Day is right after. May 5th is Children’s Day which completes this week of relaxation. Children’s Day is when families pray for their sons to achieve health and success in their lives. For the daughters who feel left out, don’t worry, Girl’s Festival is celebrated as well which occurs on March 3rd. Depending on how the weekend’s line up, it’s possible that this week-long mass vacation can last through an entire work week as it did this year (2017). Many will be given time off, or take time off on their own account; this leaves many to celebrate the week from Tuesday, through to Sunday! It won’t time up like this again until the year 2023, so it was a pretty big deal this year. If planned right and with enough luck, you can actually save a good amount of money during Golden Week. With flights, you can try waiting until the last minute when airlines try to fill the rest of a flight. Despite it being a popular season, no airline wants to fly empty seats across the sea to Japan. Last minute deals will pop-up and when you spot one, grab it! Plenty of hostels see this as a good time to gain customers, so they’ll hold fun events like the one I stayed at during this time. After my visit to Korea, I flew to Osaka, Japan (again) and stayed at a nice hostel right in the popular Dotonbori area. 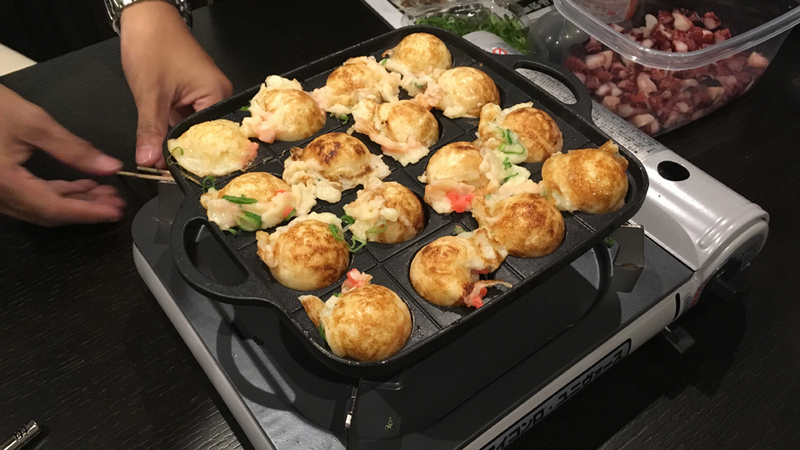 They had only one bunk left and I was able to nab it at a decent price, so when I arrived I was excited to learn that I would be taught how to make Takoyaki (Octopus Balls). You’ll also meet a lot of fellow travelers from all over, though most will be from around Asia as this holiday week is found in other countries nearby as mentioned earlier. Another positive aspect about visiting Japan at any time of the year is that prices for things like food and transportation don’t rise due to the season. Regardless of the time of year, you’re paying the same price you would any other time. Social gathering places like clubs will be more exciting during this week; this means you’ll pay less since it’s a weekday, but it’ll be packed as if it’s the weekend! If you’re a member of sites like backpackr (social networking application on iOS for backpackers) you may notice a rapid increase during this time as well. There’s no shortage of people to meet, busy clubs, packed Starbucks, souvenir vendors, and so on during this time period. Luckily you’ll find that many side streets aren’t touched at all by foreigners regardless of how busy it gets; many of these streets don’t have the “tourist appeal” so I always use these as shortcuts! If this sounds like your kind of trip, Golden Week in Japan could be an ideal time for you to plan your trip! It’s crowded… and I mean it’s REALLY crowded, everywhere! I usually don’t mind crowded areas (I absolutely love Tokyo which collectively has roughly 38 million people) but during Golden Week it is just a little bit too much. And since many locals don’t have work during Golden Week, you’ll have travelers, tourists, and locals; with many tourists coming from Korea specifically. This makes the areas that are normally busy to begin with, almost unbearable. 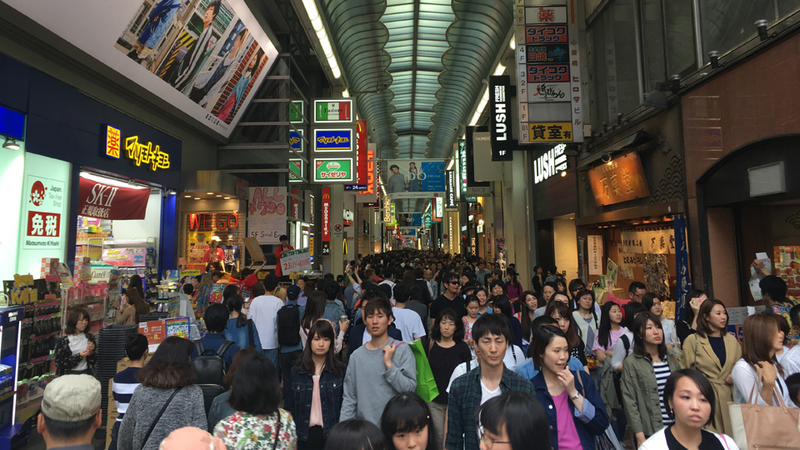 Pictured below is one of the many shopping streets of Dotonbori. As I said before, crowds don’t bother me; but it’s easy to become annoyed when a 5-minute walk ends up taking 30 minutes. Despite how populated the cities of Japan are, I never failed to be able to walk down any street at my own pace; Golden Week can make that impossible. I was only in Osaka during the Golden Week of 2017, but that was enough of an experience to tell me not to visit any major city at all again during this time. My original destination was Fukuoka, but even that wasn’t possible without spending at least $70 a night in a hotel; all hostels and Airbnb listings were booked solid. This brings us to the best thing about Golden Week; the end! After Golden Week finishes it’s a bargain hunters dream. Prices for lodging and flights drop down to some yearly lows. After everyone flies back home, that’s when you book your flight to Japan; this method will allow you to enjoy this beautiful country with more time and more cash in your pocket! This also applies to Korea as well as this scenario is the same for places like Seoul, Busan, and especially Jeju island! In my opinion, regardless of the season, if you have the chance to visit Japan, take it! Thanks for reading and check back again soon for another article! ← Previous Previous post: The Most Dangerous Border Crossing On Earth?